Characterization of composite tissue engineered intervertebral discs using primary or mesenchymal stem cells under free swell, growth factor treatment, or mechanical stimulation conditions. Hudson K., R. Mozia, L. Bonassar. “Dose-Dependent Response of Tissue Engineered Intervertebral Discs to Dynamic Unconfined Compressive Loading” 2014, Tissue Engineering Pt. A, submitted. Grunert P., H. Gebhard, R. Bowles, A. James, H. Potter, M. Macielak, K. Hudson, M. Alimi, D. Ballon, E. Aronowitz, A. Tsiouris, L. Bonassar, R. Härtl. “Tissue-engineered intervertebral discs: MRI results and histology in the rodent spine” 2014, J Neurosurg Spine, 20 (4), 443-451. Grunert P., K. Hudson, MR. Macielack, E. Aronowitz, BH Borde, M Alimi, I. Nkoku, L. Bonassar, D. Ballon, A. Tsiouris, R. Härtl, “Assessment of Intervertebral Disc Degeneration Based on Quantitative Magnetic Resonance Imaging Analysis: An In Vivo Study” 2013, Spine 39 (6), E369-E378. Grunert, P., B. Borde, K. Hudson, M. Macielak, L. Bonassar, R. Härtl. “Annular Repair Using High-Density Collagen Gel: A Rat-Tail In Vivo Model” 2014, Spine 39 (3), 198-206. Hudson K., M. Alini, P. Grunert, R. Härtl, L. Bonassar. “Recent advances in biological therapies for disc degeneration: Tissue engineering of the annulus fibrosus, nucleus pulposus and whole intervertebral discs” 2013, Current Opinions in Biotechnology 24 (5), 872-879. Grunert, P., K. Hudson, S. Towne, L. Bonassar, R. Härtl, “Tissue-Engineered Intervertebral Discs: In Vivo Outcome in the Rodent Spine” 2013, Spine Journal 4 (S 01), st6. 01. Grunert P., B. Borde, K. Hudson, M. Macielak, L. Bonassar, R. Härtl, “Annular repair using high density collagen gel; in vivo outcome in a rodent spine model” 2013, Spine 13 (3), S51. Grunert P., B. Borde, S. Towne, K. Hudson, L. Bonassar, R. Hartl, “High-Density Collagen Gel Can Repair Annular Defects and Restore Biomechanical Function to Needle-Punctured Intervertebral Discs” 2013, Global Spine Journal 4 )S 01) st6. 07. Hudson, K.D., P. Grunert, S. Towne, R. Härtl, and L. Bonassar. “Structure and Function of Tissue Engineered Intervertebral Discs from Human MSCs” 2014, World Congress of Biomechanics, Podium Talk. Hudson, K.D., P. Grunert, S. Towne, R. Härtl, and L. Bonassar. “In Vivo Function and In Vitro Characterization of Tissue Engineered Intervertebral Discs Made with Human Mesenchymal Stem Cells” 2014, ORS Annual Conference, Podium Talk. Hudson, K.D., P. Grunert, S. Towne, R. Härtl, and L. Bonassar. “Evaluation of in vivo function of tissue engineered intervertebral discs made with human mesenchymal stem cells” 2013, Philadelphia Spine Research Symposium, Podium Talk. Hudson, K.D., R. Mozia, and L. Bonassar. “Mechanical Stimulation of Composite Tissue Engineered Intervertebral Discs” 2013, ORS Annual Conference, Poster. Hudson, K.D., R. Mozia and L. Bonassar. “Effects of Dynamic Compression Stimulation on Tissue Engineered Intervertebral Discs” 2012, BMES Annual Meeting, Podium Talk. Mozia, R., K.D. Hudson, L. Bonassar. “Mechanical Stimulation of Composite Tissue Engineered Intervertebral Discs” 2012, ORS Annual Conference, Poster. 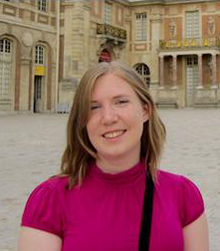 Katie attended Purdue University in Indiana before coming to Cornell for her graduate work. She is currently does outreach at local elementary schools with Cornell Lego Robotics. She is avid traveler and enjoys baking, running, and gardening.